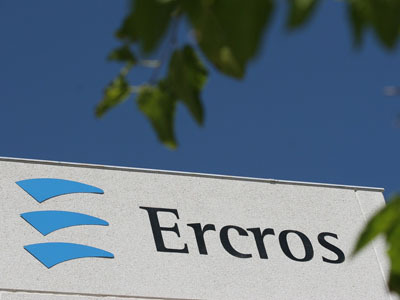 Barcelona, February 25, 2016.- In 2015, Ercros obtained a profit of EUR 7.24 million. This result exceeds EUR 13.53 million the 2014 results, when the company posted a loss of EUR 6.29 million. This improvement comes from the growth in sales and the moderation in expenses, and also is due to the impact of measures to improve productivity carried out in recent years. The markets in which the company operates generally performed well over the past year. Sales reached EUR 618.27 million, 2.4 % above the previous year, which amounted to EUR 603.67 million. This increase occurred despite the sale of the factory in Palos de la Frontera and the Salina de Huelva, on June 2, 2015. Sales increased in both domestic and international market. Sales in Spain, amounted to EUR 317.70 million, representing 51.4 % of total sales and were a 2.6 % higher than in 2014. While exports, which amounted to EUR 300.57 million (48.6 % of the total), increased by 2.2 %. The market segment that showed the most favourable development was the OECD, Turkey and the US at the top, with an increase in sales by 24.2 % over 2014. This segment accounts for 8.1 % of Ercros total sales. Despite the lower relative weight, the European Union is still the main market of the group abroad: sales in this market decreased by 2.3 %, but still represent 26.9 % of total sales. The crisis in emerging markets has weakened Ercros sales in countries of the rest of the world, in which the sales in 2015 have almost stalled. In this area is located 13.6 % of the group's turnover, which is intended primarily to India, Brazil, China and Russia. By business segment, the group of chlorine related businesses has increased its sales by 1.8 % to reach a total of EUR 385.11 million. But it has been the division of pharmacy, with a turnover of EUR 48.83 million, the one that has shown the most favourable performance, with sales growing at 24.6 %. The reasons of this improvement must be found in the good performance of the main products of the division and the strengthening of the US dollar against the Euro, the currency in which the 44.8 % of division’s sales are nominated. The strengthening of the US dollar has also benefited the intermediate chemicals division, with 22.6 % of sales nominated in this currency. Moreover, the slowdown in emerging markets has been reflected in lower sales of the products traded in these markets. Taking all in consideration, and despite the fact of increasing margins, in 2015 the turnover of this division fell by 1 %, reaching EUR 184.33 million. 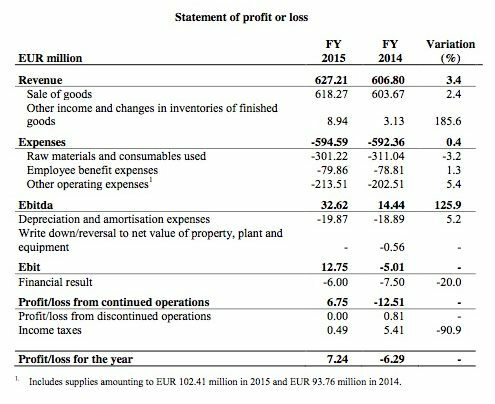 Ercros revenue in 2015 amounted to EUR 627.21 million, 3.4 % higher than in 2014. The increase in revenues by EUR 20.41 million is mainly explained by higher sales already mentioned (EUR 14.60 million), but also by the increase the other income (EUR 5.81 million). In 2015, total expenses amounted to EUR 594.59 million, 0.4 % higher than the previous year. The largest increase in this chapter corresponds to the other operating expenses, which includes the increase in the electricity bill by EUR 8.69 million. This significant increase in electricity cost has been partly offset by the good performance of procurements that together, decreased by 3.2 % mainly due to the reduction in the price of ethylene and methanol. The most influencing raw materials on the costs of the group are electricity, methanol and ethylene. These three products represent 53 % of the total consolidated purchases, and overcome 40 % of the total costs of chlorine-soda, formaldehyde and PVC manufacturing processes. The section «Other operating expenses», that amounted to EUR 213.51 million, increased by 11%. This section, in addition to supplies, also includes other costs arising from the dismantling of obsolete plants and soil remediation, maintenance costs, rental of facilities and equipment and provisions for impairment of assets to cover possible customers’ insolvencies affected by the current environment of crisis in emerging countries. In 2015, the ratio «Raw materials and consumables used to revenue» has experienced an improvement of two points compared to 2014, moving from 67 % in 2014 to 65 % in 2015. Employee benefits expense increased by 1.3 %, mainly due to the partial recovery of the wage freeze agreed in prior years. In 2015, the average Ercros workforce was 1,369 people, 1 % lower than previous year. From the first signs of the past economic crisis, the company has executed several restructuring plans aimed to reduce fixed expenses and improve profitability. Comparing 2007 and 2015, fixed expenses have decreased by EUR 59.26 million, which represents the 29 % of the initial expenses. However, this expense reduction has been offset by the sharp increase in the price of electricity, that has increased by 76.5 % during the same periods. The higher growth of income over expenses has resulted in a significant improvement in margins and profits for the company. Earnings before interest taxes, depreciation and amortisation («ebitda») grew by 125.9%, from EUR 14.44 million in 2014 to EUR 32.62 million in 2015, an increase of EUR 18.18 million. The ratio «ebitda to sales» has more than doubled from 2.4 % to 5.3 %, which represents an improvement of around three points. After deducting depreciation and amortisation expenses, which increased by 5.2%, earnings before interest and taxes («ebit») amounted to EUR 12.75 million compared to a negative ebit of EUR 5.01 million in 2014. The financial result has amounted to EUR -6 million, representing a reduction of 20 %, as a result of interest rates reduction, the positive impact of changes in exchange rates and the debt reduction. The item «Profit/loss from discontinued activities» in 2014 corresponds to the result of the activity of animal feed phosphates manufacturing and marketing, which was sold in April that year. As a result of these facts, the financial year 2015 shows a profit of EUR 7.24 million compared to a loss of EUR 6.29 million in 2014, representing an improvement of EUR 13.53 million. This difference is even more significant considering that in 2014 the item «Taxes» recorded an income of EUR 5.41 million as a result of the reduction of the tax rate of corporate tax from 30% to 25%. In 2015, the amount under this item amounted to EUR 0.49 million. Economic analysis of the balance sheet. The economic analysis of the balance, which is presented below, shows a decrease of non-current assets of EUR 7.64 million, due to depreciation charges and low capital expenditures, and an increase of EUR 10.79 million in working capital, mainly due to the reduction in the balance with suppliers. The increase in company equity by EUR 7.69 million can be explained by the sum of the profits for the year and the capital increase carried out in early 2015. The reduction in net financial debt by EUR 8.29 million is due to, on one hand, the redemption of debt for an amount of EUR 23.42 million and, on the other hand, the withdrawal of new funds from the factoring facility. 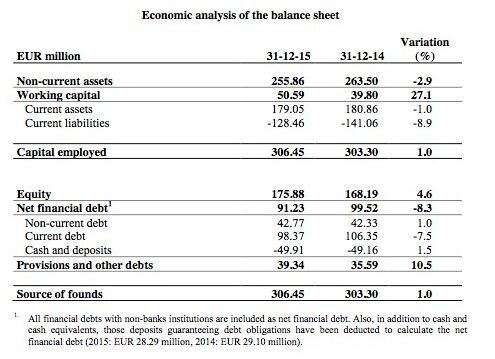 At the end of 2015, the outstanding net financial debt amounts to EUR 91.23 million. Between 31 December 2014 and 2015, the ratio «net financial debt to equity plus net financial debt», which measures the level of indebtedness of the company compared to all its financing sources, and therefore the solvency of the company, improved from 0.37 to 0.34 due to the significant reduction in net debt and increased equity in 2015. In this same period, the ratio «net financial debt to ebitda» improved significantly from 6.89 times to 2.80 times as a result of the increase in ebitda between the two financial years and the reduction in net financial debt. A reduction that clearly reflects a significant improvement in the ability of the company to serve its debts. The company expect the 2016 results to follow the trend started in 2015, with a moderate growth in sales and slight decrease in expenses. Company assumes on revenue side: higher sales of PVC, pentaerythritol and sterile fosfomycin, the latter as a result of the greater availability of product once the new plant starts its production activities this year; and on expense side, a certain decrease in electricity price, which certainly would impact positively on group margins, and further reduction of prices of major raw materials, as methanol and natural gas. The main risks that could impact Ercros forecasts for this year are: changes in exchange rate of foreign currencies, mainly the evolution of the rate EUR/USD, as Euro weakened to USD in the first weeks of the year arising some doubts about the USD strength, and a worsening global economic environment, that could impact more heavily to the emerging countries.